Bus travel for children and young people in Chesterfield will be cheaper from next week following the launch of a special offer ticket. 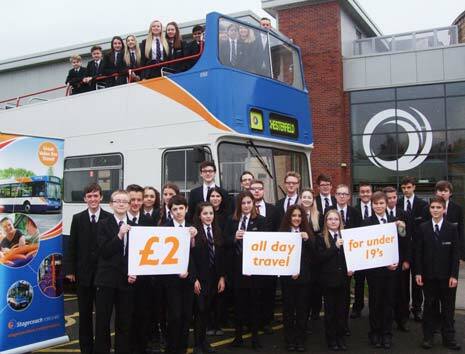 From Saturday, 23rd January, Stagecoach is introducing a Chesterfield Child Dayrider, offering travel across the area for passengers under the age of 19 for £2. The ticket will be available for limited time, until the end of March 2016. The ticket will provide unlimited daily travel for the full route of services 2, 2a, 5 10, 39, 80 and 80a in Chesterfield and all Stagecoach buses within the boundaries of Sheepbridge, New Whittington, Brimington, Hasland, Wingerworth and Holme Hall. Paul Lynch, managing director of Stagecoach Yorkshire, said: "The new special offer £2 Chesterfield Child Dayrider allows our younger passengers to make as many journeys as they like for one day within the Chesterfield area. "It is great value for money and will help young people to save money on their travel costs so they can enjoy leisure activities across Chesterfield."